Today we have another shot of St. Michael’s Mount, this time from the causeway leading to the island soon after the tide had receded enough to allow for foot traffic. We we took the boat over to the mount in the morning, there was only the faintest hint of the causeway below the choppy surface waters, but only a few hours later and we were walking back a few metres below where we formerly floated. As soon as the causeway’s cobbles were exposed to the sun, a steady stream of people slipped, stumbled and stepped lightly from shore to shore so you can imagine that this shot took a bit of patience (both pre- and post-processing) to get to its present state. It only proved possible thanks to the tourist removal trick. I combined that trick with shooting a panorama of the scene to get a wider view than my equipped lens would allow. I aimed to catch the sweep of the causeway as it approached the island and I think I succeeded there. This entry was posted on Monday, August 2nd, 2010 at 7:15 pm. 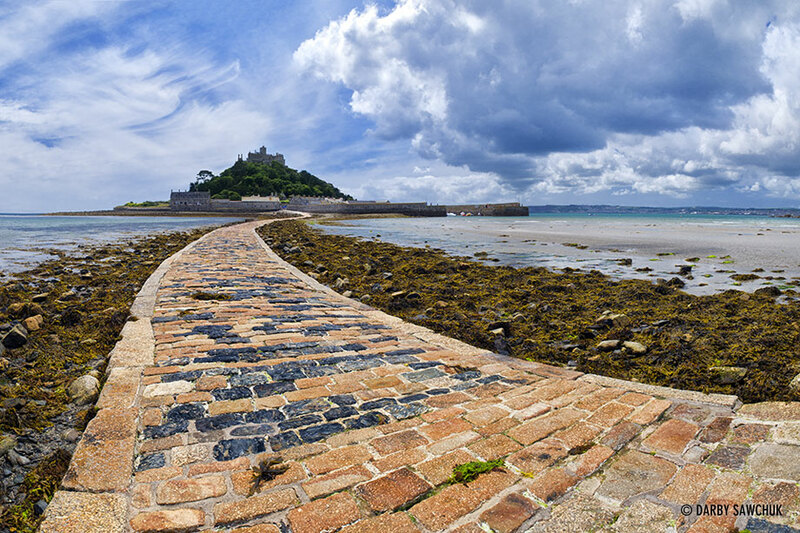 It is filed under Blog, England, Photo of the Day, Photography and tagged with cornwall, landscape photography, Photo of the Day, Photography, potd, st michael's mount, travel photography. You can follow any responses to this entry through the RSS 2.0 feed.